The videos are of very high quality and are professionally produced. Once you have viewed the lessons and are ready to exit, I strongly suggest you view the exit video in its entirety. You will get a good appreciation for the work that went into creating this program. Note: the screen shots included here are lower resolution than what you will actually see on the screen. 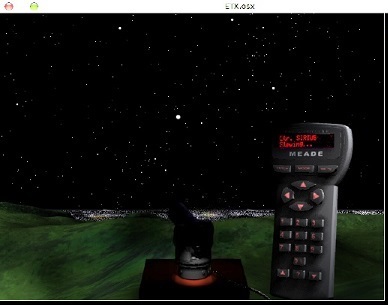 Besides lessons, with voice narration and video, there are simulations where you can interact with an onscreen Autostar to "control" a virtual telescope. There are also tests you take to reinforce your learning. New in this version are "Solo" and "Training" options; you can select which one suits your learning stage. The lessons each take about 1-2 minutes to view, so it will take you at least an hour to go through the entire suite of lessons. And perhaps much longer as some may require you 10-15 minutes if you go through them indepth. The simulations are very good. I purposely made a pointing error when simulating centering an alignment star and the program reported that I made a "3% pointing error". Impressive! Here is an example simulation session screen. 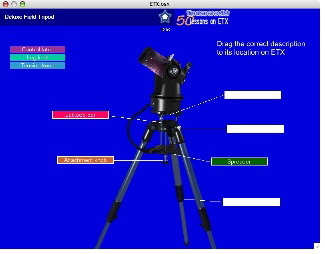 You click the buttons on the Autostar graphic to make it perform just like a real Autostar and you see the ETX telescope slewing as it normally would. 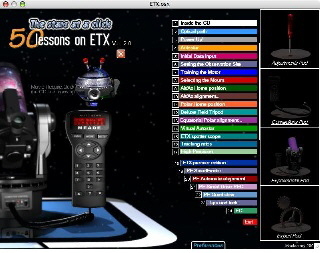 If you don't like reading manuals or you find the Meade documentation lacking, or you want to go beyond the tutorials on the ETX Site, which includes the Meade video tutorials, I can highly recommend "50 Lessons on the ETX" to expand your ETX and Autostar knowledge in a fun and informative way. Another example of interactivity in some of the lessons is this test (new in this version), where you drag labels onto the proper locations on the image. If you make a mistake you get immediate feedback.